Hodo kwaja is a Korean filled sweet that is shaped like a walnut. In the mid-1930s, a Korean baker (one Mr. Cho Kwigum) was apparently contemplating a madeleine and said to himself "You know what would be great? It would be great if there was stuff inside of this thing." 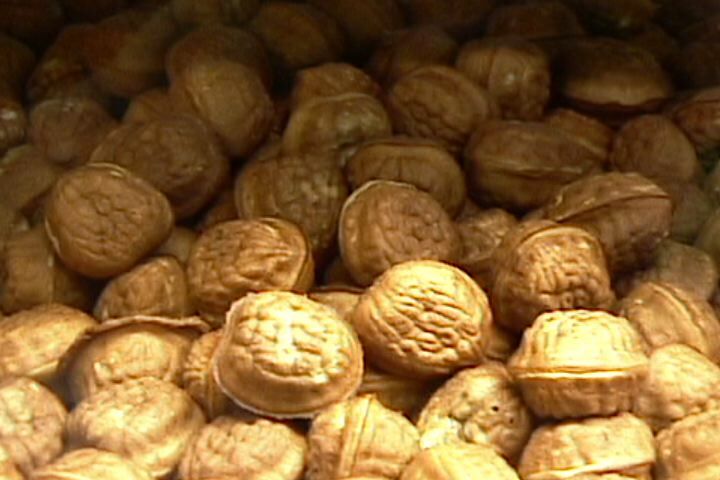 He gave it a distinctive walnut shaped mold, chose a popular filling, and named it, and Korea has loved them ever since. We found a coffee shop (descriptively named "Hodo Kwaja") in Little Korea in Toronto that sold hodo kwaja, madeleines, hot coffee, and nothing else. 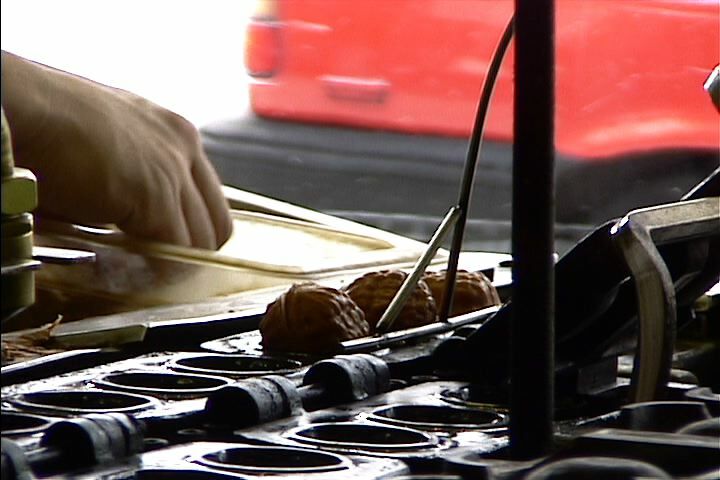 The walnuts are filled with either a red bean paste or a mixture of mashed potatoes and walnuts or almonds. The dough is a basic madeleine dough like you or I would make at home. The mashed potato hodo have a cloying maple flavor that makes them taste a little too breakfasty for me. I preferred the red bean versions, but the rule here is "get whichever ones are still hot." Their coffee is great. The most impressive part of the experience, for me, was the robotic hodo kwaja assembler, which inspired me to come back the next day with the video camera and make this short film. I want one of those machines for my living room. Oh yes. Oh yes, I do. Tomorrow I'll be talking about the process of making this video and some neat things I learned about Final Cut Pro, but for now, just enjoy the video. And, if you're hungry, make yourself some madeleines. Hodo Kwaja can be found at 656 Bloor St. West in the Annex district of Toronto. For madeleines, I like the Joy of Cooking recipe, and also this Food Network recipe. Any madeleine recipe that begins by telling me to prepare a bain-marie I discard as being too full of itself. Nice video; you made me hungry! We've got similar pastries here in Japan--taiyaki. They are a bit bigger, shaped like fish (tai), and usually filled with red bean paste, but no walnuts. I've also see the same idea done in the shapes of the heads of the seven lucky gods. And plain capsule shapes about the size of those walnuts with a wider variety of fillings. Always best eaten hot off the grill.